John Olsen: The You Beaut Country opened last week at the NGV Australia in Fed Square. The exhibition is the largest in his seven decade career. Olsen has carved a place in Australian art history and is known for his energetic painting style and evocative landscapes that have captured Australia’s unique terrain and spirit with a distinct visual language. The latest instalment of Olsen’s career-defining landscapes series, The you beaut country that started in 1960 was unveiled and highlights Olsen’s lifelong interest in the natural world and his continued pursuit to capture the Australian identity. The exhibition features his most iconic and arresting works including large-scale paintings of Lake Eyre, the Simpson Desert, Sydney Harbour and his much-loved tree frogs. A major figure in the story of Australian art, Olsen is a highly acclaimed and decorated artist and has been awarded the Order of Australia and the Order of the British Empire for his services to the arts. Among his many prize-winning works, the exhibition includes his Archibald Prize-winning Self-portrait: Janus faced, 2005. 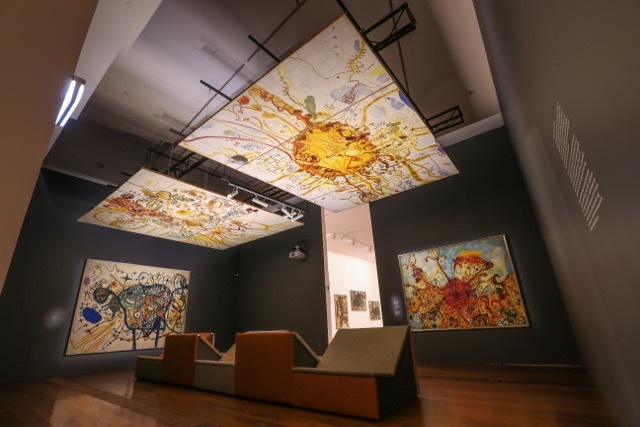 John Olsen: The You Beaut Country also reflects Olsen’s varied interests, including Spanish cooking and culture, poetry and journal writing, as well as the diverse use of mediums in his practice, including tapestries, printmaking, ceramics and sculpture. Kids and families are invited to visit this great Australian exhibition and draw something special on sheets of paper inspired by Olsen’s sketches and drawings. John Olsen: The You Beaut Country is on display at The Ian Potter Centre: NGV Australia at Federation Square from 16th of September 2016 to the 12th of February 2017 and will be shown next at the Art Gallery of New South Wales from the 10th March until the 12th of June 2017. For more info, go to the NGV's dedicated site. For more kids activities, programs, exhibitions and events, visit our blog or daily spots.